« An eye for an eye. The only people who object to ID cards and CCTV are ‘bad people’, right? I mean after all, everyone knows that the people who work for the State are of a more incorruptable and moral nature than us mere private people. Yeah, right. The State is not your friend. Why is it that if I’m caught looking into a naked neighbour’s bedroom with a pair of binoculars, it’s ME who gets arrested, yet if the self-same good-looking neighbour happens to be passing MY house when I’m stood naked in the bay window, it’s ME who gets arrested again? Where’s the equality in that? But seriously folks, the usual suspects came forward in the previous thread to tell us there’s nothing to worry about in the state surveillance of public places. Well, it didn’t take long for that argument to crumble. But who was watching the people watching the 2 defendants? I think we should be told. ID cards are proven to be useless in the war on terror (e.g.madrid bombing) and its only purpose as far as I can see, is to be another stealth tax for our slave Labour government. Why the hell should I have to carry a card in our supposed ‘free’ country. I refuse point blank to ever have one, even if it was given away free. You know things are getting bad when supermarkets like Tesco have more information about the general population than the government. I think it is infinitely better for Tesco to hold my information than the government provided it is collected legally. That way they only hold the information I choose to put into the public domain. The government likes to hold information that I would prefer was kept private. Like? Well I thought this was a pretty good example. no idea why that didn’t work. Perhaps that is you have nothing to fear if you have nothing to hide, and are sexually unattractive, and have no connection to anybody famous, do not watch movies on a TV that CCTV operators can see as well, and don’t do anything that bored CCTV operators might find interesting (e.g. crosswords), and vote New Labour? 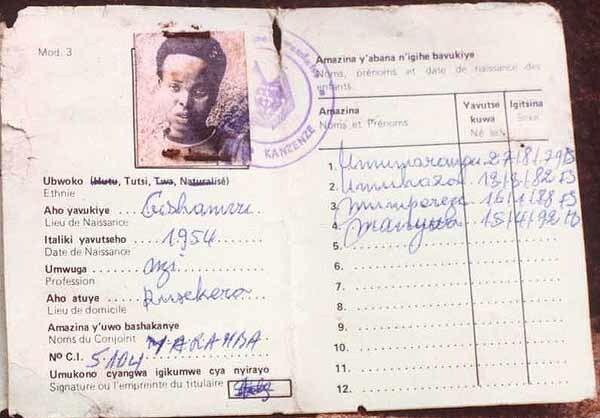 Jude is a great image, it inspired me to make this one more directly linked to ID Cards, since it is one from Rwanda (the text is a bit small but you can still read the enthnicity, Tutsi). “Mr Judge and Mr Welsh were recorded playing back the video of the woman, the court heard. I’m feeling a bit dim today. Is there a difference between misconduct in public office and misconduct in a public office? Why should anyone innocent worry if CCTV cameras are installed inside every home so the government can investigate possible child abuse, wife beating, drug dealing, racist comments or any other criminal activity? Would those who are so keen to lumber us with ID cards support such cameras, and if not, why not? What are innocent people allowed to hide from authority? Funny how most countries in Europe have ID cards and are no less free than us. And before anyone starts on about how Britain is uniquely free blablabla, the (British) state is not our friend. Come on guys, cut the hysteria. What hirrible crime have those poor guys done ? I’m sure, if Perry had a pair of binoculars and an atractive neighbor he would do the same. It’s totaly harmless; next time the lady should draw her curtain. Can government abuse CCTV camers ? It can. But this isn’t a good example. On the other hand there was a story in the papers (a few days ago) about a guy in NY who was murdered by being pushed under a train. These murders are always a mystery – you never know if the victim fell or was pushed, and by whom. But in this case the police got the murderer within several hours, thanks to CCTV camers. karl.rove: and are no less free than us. Are you sure about that? Certainly all EU countries rank among the free-est in the world as far as civil liberties are concerned; but there’s small choice in rotten apples: the competition is not that hot. No less free than us is a pretty strong claim. If you do get on the wrong side of the state or a state functionary, some EU countries are distinctly better than others. The only glimmer of good in this story is that the alleged peepers are at least being dealt with. Let us assume that something similar happened with security guards running a gated community run as a private concern. I’d hope they’d be sacked on the spot. By the way, where is Euan Gray? He usually likes to point out what hysterics we are on this issue. Guy is right – look at the Belgian justice system, for example. It’s not a pretty sight. From a utilitatian point of view, the case for CCTV cameras is rather strong, so I don’t advocate arguing against them on those grounds. It’s much more a question of principle. Somehow this probably left the victim less than ecstatic,certainly CCTV does not deter these murderers,it may make the job of the police easier,but it doesn’t make us safer. “Karl Rove” cannot understand that different countries are unfree in different ways and so by his logic, if we adopt the ways in which other countries are unfree and add that to our own special ways the British state makes this country unfree, that is not making things worse. What a clever chap he is. Having a murderer locked up behind bars instead or roaming the streets does make us somewhat safer. As I said in my post, the British Staat is not your friend. But it likes you to think that, however much it interferes in our lives with its political cowwectness, we can give thanks that we’re better of than those funny foreigners. We all have something to hide. I have something to hide. Every single person reading this blog has something to hide. Every one. It is an ineradicable and inescapable part of what it is to be a human being. Only to those with no insight into him/herself or others could this not be plainly obvious. Why is this obvious grown-up truth not fed back to those making the argument every single time? But what have we to hide? Well, that’s a question determined by who’s doing the finding, isn’t it? And if it’s a fully-specced, unaccountable and overmighty state that’s doing the finding. . . . . I’d suggest we all have something to fear. Of course CCTV cameras can be useful, of course ID cards could bring benefits, anyone protesting their worth is missing the point – whether intentionally or due to extreme stupidity. All tools can be used for the good, but they can also be abused. If we allow the state powerful tools we must be sure that the state will not abuse them, if we cannot be sure then we shouldn’t allow them. The state is not just those nice men and women in Parliament, it is also a few million jobs-worths and incompetent bureaucrats, many of whom would never be given similar responsibility and power in the private sector simply because they are unfit for it, cannot be trusted with it etc.. These are the people to whom we expose our private lives, we give them information in our license applications, our tax returns, even in our medical records, that we might not share with anyone else. If such people are so corrupt and depraved that they cannot even be trusted to keep the cameras focused on looking for yobs rather than zooming in through a window to watch a girl dropping her skirt, then how can we possibly trust them with details of our bank accounts, our identities, our assets, our ailments? We cannot: this trivial case exemplifies why the state cannot be trusted with ’empowerment’ , why it cannot be trusted with even the most trivial possibility of incursion into our lives, because if abuse is theoretically possible then one or more of those millions of jobs-worths and bureaucrats will find a way to turn it from theory into practice. Since most murders are one offs,that is irrelevant.